I was here because the paper that I mentioned a while back that is technically forthcoming only not really, of which I have now had gloomy confirmation from its editor alas, really needs at least one good-quality image, and there are several other documents held here of which, again, I have long wanted a decent facsimile. So, I was after getting some. And in some ways this proved to be very simple, in as much as the Archivo and its staff were very happy to make this possible, in so far as they could understand what I actually wanted and I their instructions about how to get it. (El meu castellano es molt pitjor que el meu català; em disculpeu…) In other ways, much like their digital resource search engine I mentioned a few posts back, it was really pigging complicated. I had already identified the parchments of which I wanted images. There was a form to fill out. That form was then approved by a senior person. Now, he could take the (very small amount of money) they would charge me for this and they would send me a CD-R with the images on. But not straight away. No, first I had to send one of my copies of the form to Madrid, to be approved by the officials of the Biblioteca Nacional there. Then the form would come back to Barcelona, someone would make the images and tell Madrid to send me a formal agreement to sign. Once that was received by Madrid, they would tell Barcelona to send me the CD-R. Six separate stages. All this correspondence and office time must have cost them far more than I actually paid for the facsimiles. But, I got the first part of the form away very shortly after I got back, Madrid responded a month or so later, and then I probably waited a bit longer to answer again because of the exigencies of teaching. It still took rather a long time for the actual images to turn up, however. In fact I was getting rather annoyed and afraid they’d been mislaid. 1. 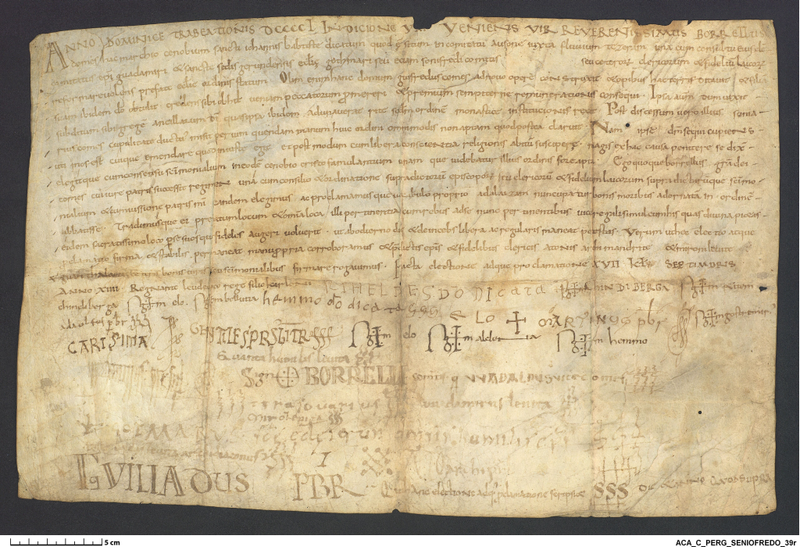 The two parchments are, respectively, Barcelona, Archivo de la Corona de Aragón, Cancilleria, Pergamins, Seniofredo 39 and Wifredo 8, published (the latter with monochrome facsimile) in Federico Udina Martorell, El Archivo Condal de Barcelona en los Siglos IX-X: estudio crítico de sus fondos, Textos 18 (Madrid 1951), doc. nos 128 & 10 respectively. Well, I am back in Oxford and so are the students, and even here term is at last starting, my reading lists are not quite ready and my time is limited. I hope therefore that you’ll forgive me if I take a post to point you at some links to things elsewhere, rather than write anything substantive. Some of these I’ve been saving for a while, but some are more recent; all connect with things I’ve written about here or elsewhere so should hopefully prove of interest. First and foremost, matters blogular. Had you noticed in my sidebar that the well-known Alaric Hall, elf expert, environmentalist, drummer and general good thing, has been on tour and blogging about it? Since Alaric is a man who is not afraid either to post detailed literary analyses of novels in Icelandic or to describe his experience of a major North American city as “as great as a skate on a plate”, I reckon you’ll enjoy his writing as I don’t quite see how anyone couldn’t. Not convinced? Who do you think wins in a fight between the Rockies and Iceland? Go see. More formally, those who know me well and have been at conferences in the UK with me will probably recognise who has briefly stepped into the blogging world with this post at the British Museum’s site. Now that was an interesting job! Then, going back a long way, we have mentioned the fort of South Cadbury here in the past, largely because it’s supposed to have been Camelot. It goes back to the Neolithic, but was like many hillforts in Britain refurbished in the period immediately after the Romans left, including a timber hall dated to between 460 and 500, and reused Roman ceramics at table and so on. In 1971 Leslie Alcock, a major figure in my early medieval British thought-world, put forward a well-known argument for an Arthur-like figure based on this site, arguing that its huge perimeter could only have been manned by a substantial army and that therefore someone in that period and in that hall must have been able to raise such an army.1 (He later retracted almost all of this, but it has stuck around.2) I should have realised that there was an alternative explanation after going to l’Esquerda but recent digs at Ham Hill nearby in Somerset have raised the issue somewhere less soluble; here, the perimeter is more like three miles and you just couldn’t really have got enough people in it to hold it. The answer may therefore be that these places were both actually settlements not fortresses, and I now need to get back and read more about Cadbury-Camelot and see whether that would work.3 The Ham Hill digs are reported on in the Guardian here, which I found out about at David Beard’s Archaeology in Europe, to which a hat duly tipped. Next up, we have often talked about capitularies here, those very diverse collections of legislative bullet points the Carolingian kings issued that hardly ever seem to have been acted upon.4 I was in correspondence with someone who was lamenting that the manuscript of the collection of these things made by one Ansegis that survives from the Catalan monastery of Santa Maria de Ripoll, ACA MS Ripoll 40, was not yet digitised, and I bethought me: hang on, isn’t there a rolling initiative of the Spanish government to digitise their archives’ manuscripts? I wonder if… And lo it has been done and is here,5 so your Carolingianists who want to see how far that law got, here you are, and meanwhile I can pay a bit more attention to what other texts may have come in by the same route during the short period when the Carolingians really were trying to govern the Spanish March as directly as their other provinces. The present symposium will deal with the revisiting of several research experiences using this database, ranging from punctual experiments to fully-developed academic works. The objective of this gathering is to invite researchers to become familiar with this interface and to assess it. All researches who desire to share their experiences are welcome to make a presentation. We would appreciate it if you can let us know of your part-taking before October the 30th (email addresses provided on the header). Presentations already confirmed by Alain Guerreau, Eliana Magnani, Nicolas Perreaux et Armando Torres Fauaz. … and that looks like interesting stuff to me even if I can’t actually go. They sent me CFP PDFs in French and English so I’ve linked them there for you. There is also a shedload of stuff that could be mentioned about Picts, but since that is relevant to my interests just now and I haven’t finished thinking about what the new finds mean, or indeed likely talking about them to Alex (again) who was kind enough to alert me to one of them, I will write more on that further down the line. For the moment, here’s a post! 1. Leslie Alcock, Arthur’s Britain: history and archaeology AD 367-634 (London 1971, repr. Harmondsworth 1973, 2nd edn. 1989), pp. 221-226 & 347-349 in the 1st edn., with some account of the whole hillfort phenomenon at pp. 179-181. I always forget until I dip into this that despite Alcock’s own later misgivings (see n. 2 below) it was a really good book when it came out and still holds its own remarkably well in the face of forty years’ subsequent research. 2. Idem, Kings & Warriors, Craftsmen & Priests in Northern Britain AD 550-850, Society of Antiquaries of Scotland Monographs (Edinburgh 2003), p. 5. 3. Alcock was of course the principal excavator of that site, which is how he got to make that point; I’ve read idem “Cadbury-Camelot: a fifteen-year perspective” in Proceedings of the British Academy Vol. 68 (London 1982), pp. 354ff, repr. in idem, Economy, Society and Warfare among the Britons and Saxons (Cardiff 1987) pp. 185-213, but should now complete that with idem, S. J. Stevenson & C. R. Musson, Cadbury Castle, Somerset: The Early Medieval Archaeology (Cardiff 1995). 4. Christina Pössel, “Authors and Recipients of Carolingian Capitularies, 779-829″ in Richard Corradini, Rob Meens, Pössel & Peter Shaw (edd. ), Texts and Identities in the Early Middle Ages, Forschungen zur Geschichte des Mittelalters 12, Denkschriften der phil.-hist. Klasse 344 (Wien 2008), pp. 253-274. 5. I’m not sure if it’s possible to get durable links out of the PARES system, so if that doesn’t work, the way to get to it is to start with the Busqueda Avançada and choose Archivo de la Corona de Aragón in the Filtro de Archivos, then Diversos y Colecciones in the Clasificación, Manuscritos in the Fondo, and then stick “Ripoll” into the Filtro per Signatura and search. You’ll then get, rather than a search result, a results tree to expand, and you choose: ACA, COLECCIONES, Manuscritos, RIPOLL, the scroll-down arrow and it’s no. 40. This search engine of theirs is what you might call `highly featured’ rather than effective, but if you know what you want it’s kind of amazing what’s there and what they’ve done. 6. Most obviously to name but three, Georges Duby, La société aux XIe et XIIe siècle dans la région mâconnaise (Paris 1953, 2nd edn. 1971, repr. 2000), a few parts translated by Fredric Cheyette as “The Nobility in Eleventh- and Twelfth-Century Mâconnais” in idem (ed. ), Lordship and Community in Medieval Europe: selected readings (1968), pp. 137-55, and see now idem, “Georges Duby’s Mâconnais after fifty years: reading it then and now” in Journal of Medieval History Vol. 28 (Amsterdam 2002), pp. 291-317; Barbara Rosenwein, To be the Neighbor of St Peter: the social meaning of Cluny’s property, 909-1049 (Ithaca 1989); and Guy Bois, La mutation de l’an mil (Paris 1989), transl. Jean Birrell as The Transformation of the Year 1000 (Manchester 1992).